This blackberry ice cream is a great way to enjoy fresh summer blackberries. Sour cream adds a pleasant tang to this delicious fresh blackberry ice cream. The simple blackberry mixture is blended then strained before it is added to the cream and sour cream mixture. In a large saucepan over medium heat, combine the blackberries, sugar, and lemon juice; cook, stirring frequently until the sugar is dissolved and the berries are soft. Put the berry mixture in a blender and puree for about 1 minute. When you puree hot liquids in a blender, don't fill it more than one-third to one-half full and hold the blender lid down firmly with a folded kitchen towel in hand. Place a mesh sieve over a bowl and strain the blackberry mixture to remove the seeds. Return the strained blackberry mixture to the blender. Add the heavy cream and the sour cream to the blender and pulse a few times. Pour the mixture into a bowl; cover the bowl and chill thoroughly. Freeze the mixture in your ice cream maker following the manufacturer's directions. Replace the sour cream with 1/2 cup of Greek yogurt or thick buttermilk. 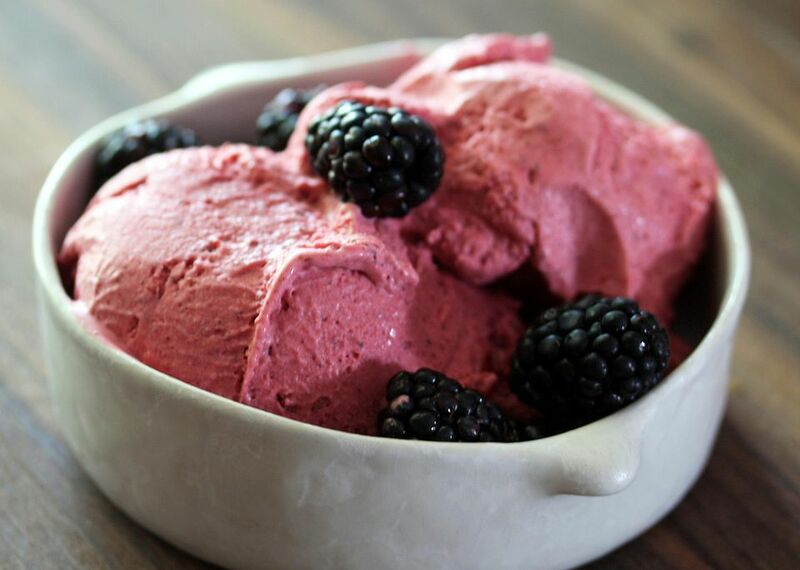 Raspberry Ice Cream: Use 2 cups of raspberries in place of the blackberries.